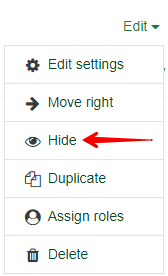 New in eClass for summer 2018, instructors may now hide activities and resources using "stealth mode" but still allow students to access the content. 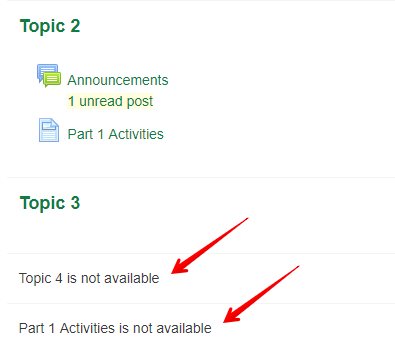 Before, instructors could hide an activity or resource, but doing so made the item unavailable and unusable by students. With stealth mode, activities and resources can be hidden, but can still be linked to for student access. This can be useful as a course design strategy where an instructor wants to nest content to provide a clean and compact course home page. Choose an activity or resource that you want to apply "stealth" to. Click the Edit drop-down adjacent to it and click Hide. Under the activity/resource will show a "Hidden from students" message. 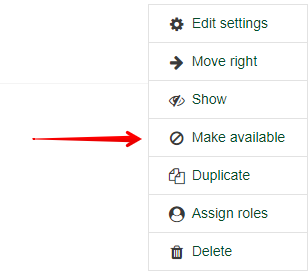 Click the Edit drop-down again and this time click "Make available." Note the new message: "Available but not shown on course page". 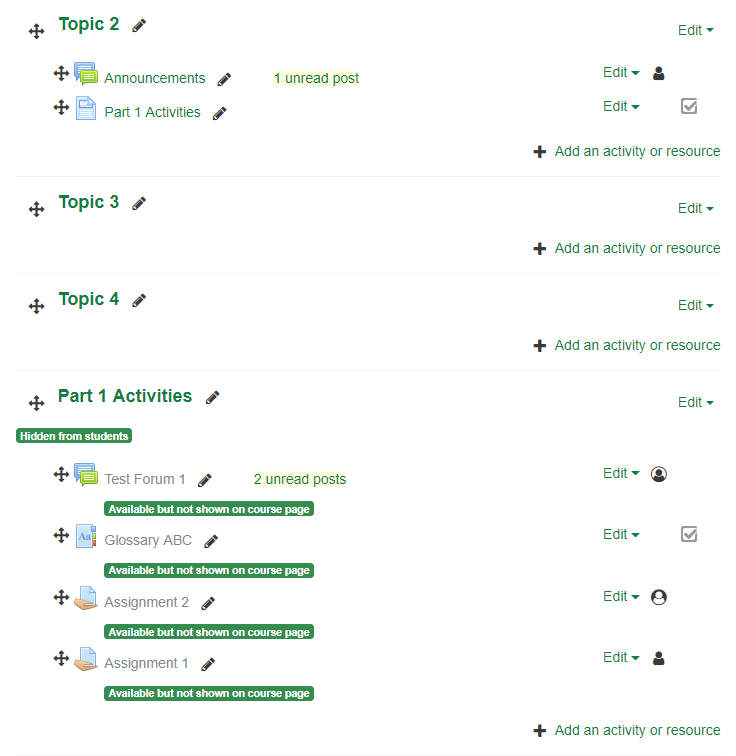 The following illustrates a clean-up of the course page by applying this setting to all the items in a hidden content section called "Part 1 Activities" and organizes them into a page resource under "Topic 2" called "Part 1 Activities". Please see the article "Adding a Clickable Link into eClass Content" for further help if you are unfamiliar with adding this type of content through the html editor. 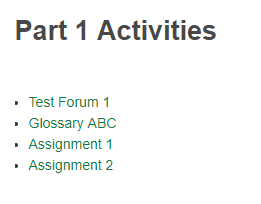 Students click on the "Part 1 Activities" page resource to access the list of activities (even though these are hidden from the main course page.) Here each of the links have been copied and added through the html editor. 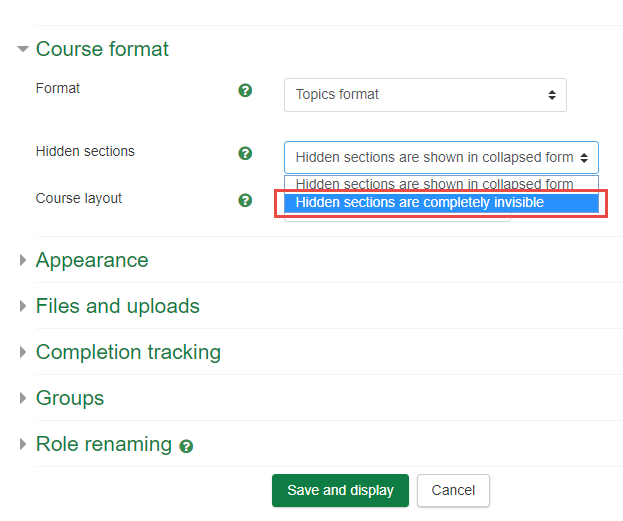 Note: If you have followed these instructions but students are seeing a "not available" message and prefer it to be fully invisible, you will have to adjust the 'Course layout' from your 'Course administration' settings by changing the option to 'Hidden sections are completely invisible'.